There are two things that matter in this world and one is world peace and the other is pie of course. And this t-shirt shows the best of both words a big pie cut in the shape of the peace sign. And sure we can share those big pieces because we are at peace and all love pie. 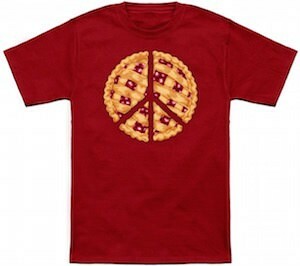 This peace pie t-shirt comes in many colors in a men and women’s version in sizes Small – 6XL. If you want peace and would love some pie to celebrate then this is the t-shirt for you. So get ready it’s time for your Peace Of Pie T-Shirt.